LadyBuds Inc., a collective garden located in Black Diamond, WA, reported yesterday over Facebook about an unannounced visit by a Washington State Liquor Control Board officer to her collective garden site. We followed up immediately by contacting the owner and the LCB officer. 420leaks contacted the owner by phone and confirmed the story. 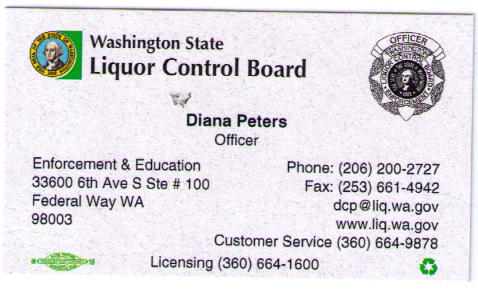 We have also asked the media contact person at the Liquor Control Board for their official response an have sent in a public records request on this or any other, or any training that involves making unannounced visits to medical collectives where they have no authority to be. Sir, my visit was merely to gain “personnel” understanding of a “medical marijuana facility.” Yes, the state is in the process of regulating the marijuana but we are not taking any enforcement actions until next year and that would still “not pertain to your establishment.” My intent was only to gain a understanding from your staff. I had done a routine unannounced premise check at the “Liquor Store” beside your business and thought I’d ask. We have other Officers in the Seattle area that have been given complimentary tours by other “Medical Marijuana Facilities” and they gained a wonderful understanding and I was just hoping for the same. I had a “ride a long” that also wanted education in your field. You sir, are the “experts” pertaining to this. I apologies for any inconvenience or added concerns this may have caused. If I can help you out in any way, please don’t hesitate to call or email. What’s going on here? The WSLCB is a rogue agency out of control. This needs to stop now. Our medical rights are getting trashed by this state in it’s desire to extract wealth from the most vulnerable in our society. (August 29, 2013 – SEATTLE, WA) At a press conference earlier today in Olympia, our state’s Governor Inslee and Attorney General Ferguson, affectionately known to us as, “Jay and Silent Bob”, announced a new memo issued by the Federal Government. The memo included new guidelines for Federal Attorneys to use when prosecuting cannabis crimes in states that have made laws for its medical or recreational use. Our state officials, the press and the greeheads in the cannabis industry are taking this as a green light to move forward with their implementation of I-502 rules and regulations. However, the Cannabis Action Coalition and other responsible press and watchdog groups are warning medical patients and those who would apply for licensing under the recreational model AND their spouses AND their financiers. The criminal laws are still on the books, you are still subject to arrest and prosecution by state officials for following state laws. 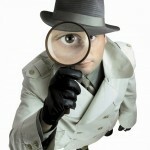 Your license and business papers will be used as direct evidence of a federal crime. For those with short attention spans, we in the medical cannabis community have been down this road before. On October 19, 2009, Attorney General Eric Holder announced formal guidelines for federal prosecutors in states that have enacted laws authorizing the use of marijuana for medical purposes. This obvious conflict is created and maintained by Federal Grant Contracts with the Washington State Patrol, Attorney General’s office and just about every city and county police force and prosecutors office. How do you HIDTA Grant? The State of Washington is obligated to enforce a federal drug control policy using state and local law enforcement. The state and local law enforcement agencies have signed High Intensity Drug Trafficking Area (HIDTA ) Grants which obligate state and local law enforcement to seize medical marijuana for the DEA. 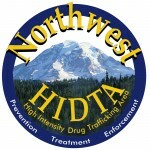 These HIDTA grants will no doubt be used to seize I-502 marijuana if they remain in effect. So far, despite being notified of the conflicts these HIDTA grants create with the medical marijuana law and now I-502, the Washington State legislature and the Washington State Liquor Control Board has failed to ask for the dissolution of the HIDTA Grants.Until these grants are terminated I-502 participants should be advised that Washington State and local law enforcement are bound by HIDTA Grant policies and those participants could be subject to arrest, seizure and forfeiture by state and local law enforcement who are then immune from breaking state laws under the Westfall Act. The public needs to understand that there never was going to be federal intervention on I-502 and that today’s announcement by Attorney General Holder does not ensure that I-502 participants will be safe. I-502 participants will only be safe once the banking situation is definitively decided and once state and local law enforcement gives 30 day notice to terminate all HIDTA grants in Washington State. So to all the hopeful recreational producers, processors, retailers, their spouses and financiers, we as medical patients would like to welcome you to our nightmare, all thanks to Jay and Silent Bob’s silence on what we are calling, “The HIDTA Scandal”. Please see the 1997 documents obtained through a FOIA request. It shows HIDTA grants were set up to combat state medical cannabis legalization efforts. It rewards police departments and courts, which were created off the backs of busting the most vulnerable people in our society, the medical patients and their providers. And HIDTA is just one of many police grants now available. 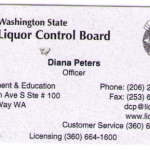 Cannabis Action Coalition board member Arthur West’s lawsuit and complaint against the Washington State Liquor Control Board. It seems the WSLCB has tried to cut corners by claiming implementing I-502 rules will not result in any significant environmental impact to the state. However, over 50 cities and some counties have been claiming otherwise in their moratoriums.